Back in January 2009 I received an email from Paul McKeown, which included the photo shown below. I'd meant to include it in the blog but for some reason it slipped my mind. Coming back to it the other day, it turned out that the photo had been found for Paul (who was in the process of writing a biography of Robert Wade, another chess player) by Bob Meadley, who's recently been in touch with me about my father, Frank Crowl. Frank is in the front row, second from the right. Note that only a couple of other players are in both this photo and the one published in the last post. 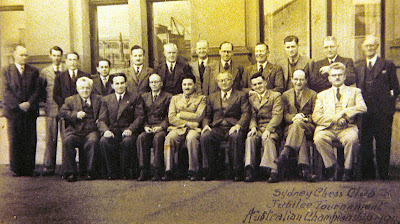 Standing left to right: official, Maxwell C Salm, Frank L Vaughan, Harry Klass, Martin Green, Daniel McGrath, Arthur C Harris, Maurice E Goldstein, Aubrey G Shoebridge, Allen L Miller, official, James Stewart (official); Seated left to right: Charles GM Watson, Stefan Lazare, Cecil J S Purdy, Garry Koshnitsky, Lajos Steiner, Robert G Wade, Frank A Crowl, A R de Coek (official).